How to say goodbye to the animals I’ve lived, breathed and dreamed for almost ten months? It’s been a time so intense, uplifting and heart wrenching that I almost feel as if the little orphans ate me up and spat me out again in a different shape. I’ve never done work before where I cried so much – tears of sadness, happiness, exhaustion and frustration. The worst was when the animals cried as well: bear cubs, deer fawns and moose calves desperately calling for their mom, injured animals crying out in pain. With each little orphan who came in I’ve wished there was a way to let its mother know that her baby was at a safe place now, that we would do our very best as foster moms, and that her little ones are loved. There are a lot of impossible things you find yourself wishing for when you are looking after orphaned wildlife. 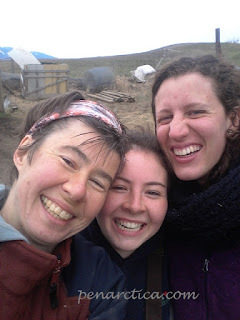 But there is something that was better than anything I could have wished for: my co-volunteers Ludmila and Brooke. We were such an awesome team. Our wildly different backgrounds, huge disparity in age, and completely different personalities somehow turned out to be a strength. In our volunteer world that largely revolved around sorting through run off fruit and vegetables, keeping track of the consistency of animal poop, and keeping the feed kitchen clean, we came to see humour in completely unfunny things. We didn’t just wash the floor, we blessed it in a daily ritual with detergent (ah, that lavender smell!). Undoing the annoying rubber bands and twist ties around interminable bundles of radishes turned into unpacking greetings from our queendom, the big agribusiness farm that produces them. And we did it. Plucking hair for DNA records from tranquilized bears (Ludi’s specialty), taking paw prints (Brooke’s expertise), taking garbage bins of compost away, sanding the icy driveway while using the sand buckets as walkers, hauling logs and branches, you name it. We were there for each other as much as we were there for our animals. Wildlife rehab takes you outside your comfort zone, pushes you to your limits and sometimes beyond them. I came to Northern Lights Wildlife Shelter to learn more about bear behaviour and wildlife in general, and to help give orphaned animals a second chance. I leave here with incredible memories of my animals. Being allowed to share in so many intimate moments of their lives was a humbling experience; the most poignant being how these animals have managed to overcome sometimes horrific trauma and eventually embraced the good things in life again. In wildlife rehab, we let the animals go once they are fit to survive on their own. Setting free who I have come to love is tough, it’s like tearing a little piece of my heart out and sending it afloat. But at the same time it’s beautiful because it feels like I have become part of something much bigger. I am lucky to have had these experiences, and even more lucky to have had such incredible people to share them with. Thank you, Brooke and Ludmila, for the jokes and laughter, for letting me drone on and on about my favourite bears, and for letting me sleep. I love you guys. You've done a wonderful thing. Congratulations! You rock! Wow. What an amazing privilege to have been able to have these experiences, and to be able to share it with us. Thank you for reading! I hope people enjoyed seeing bears and other wildlife from a perspective we rarely have access to.